A 13-year-old boy found dying at a house has left a "void that will never be filled", his family have said. 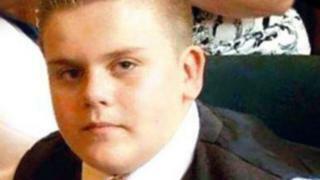 Josh Clark died in hospital after police were called to the address in Sloan Drive, Bramcote, Nottinghamshire, just before 01:00 GMT on Monday. His mother, Samantha Annabelle said she is "devastated" at the loss of her "precious" son. A 36-year-old woman arrested on suspicion of supplying a controlled drug has been released on bail. A 14-year-old boy, who also visited the Bramcote property on Monday, remains in hospital in a stable condition. Ms Annabelle, said: "Josh was my precious and youngest son. We all loved him so dearly and his loss will be felt by all of his family and friends. "He was a young boy with his whole life ahead of him. As a family we are all totally devastated. "He was a very loving young boy who filled our hearts with happiness and his passing leaves us all with the biggest void that will never be filled."